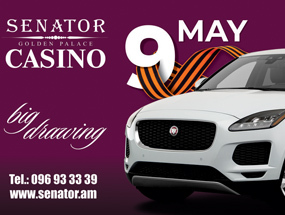 On May 9 at Casino SENATOR GOLDEN PALACE a super-car Jaguar draw will take place. Drawing will be held on gaming tables and slot machines. We wish you a successful game! 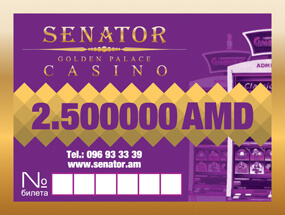 On April 20 a drawing of AMD 2,500,000 will be held in Casino SENATOR GOLDEN PALACE. Drawing will be held on slot machines. Guest presence in the draw is a must! Free travel from the Republic Square to Casino "SENATOR GOLDEN PALACE" and back. 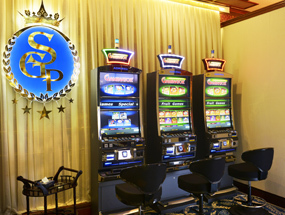 All machines are connected to the Mystery Jackpot multilevel system. Casino SENATOR GOLDEN PALACE – Rise up your intellect and financial status level!! !